Replacing the belts on the Speed Queen washing machine is a job that can be completed fairly easily in less than an hour. Speed Queen is part of the Amana line of appliances and uses many of the same parts and systems in its design. The belts in the washer can occasionally wear out or break from the constant usage while the washer is running. You can change the belts yourself without the time and expense of having to call a repairman to fix the washer for you. Unplug the electrical cord of the Speed Queen washer from the electrical outlet before attempting to replace the belts. Turn the water supply off at the shut off valves behind the washing machine and locate the screws on the panel in the front of the washer. Remove the screws at the bottom of the front panel with a screwdriver and pull the panel forward from the bottom, lifting it up off the clips at the top. Take the front panel off the washer cabinet, setting it out of the way and locate the screws underneath the top lid inside the cabinet. Remove the screws with a screwdriver from the top lid and lift the lid, flipping it back to rest on the rear hinges. 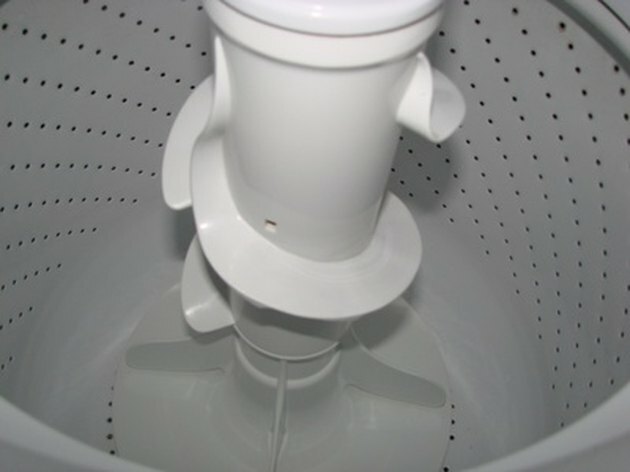 Find the two springs that are attached to the motor cradle at the base of the washer and unhook the springs from the cradle with a pair of pliers. Unfasten the bolts that hold the motor to the motor cradle with a socket wrench and tip the motor sideways, removing it from the cradle. Detach the wiring block from the motor by pulling the block off the electrical prongs by hand and locate the belts on the motor and transmission pulleys. Remove the belt from the motor and water pump pulleys and take the second belt off the motor and transmission pulleys. Place a new belt around the transmission and motor pulleys and a second new belt around the water pump and motor pulleys. Plug the wiring block into the motor, attaching it by hand and secure the motor to the motor cradle with the bolts. Attach the two springs in the front to the motor cradle with a pair of pliers and lower the top lid back down onto the cabinet, securing it with screws. Place the front panel on the cabinet, lifting the panel onto the top clips and securing the bottom of the panel with screws. Turn the water supply back on at the shut off valves and plug the electrical cord of the Speed Queen washer into the electrical outlet.